✓	YES! I want the extra wealth-building power of investing in emerging markets. Please start my subscription to Cabot Emerging Markets Investor immediately. ✓	The New Tycoon Stock for the Pacific Century –exclusive 9-page briefing on U.S.-listed stock recommendation. ✓	Email updates and trading alerts between issues. 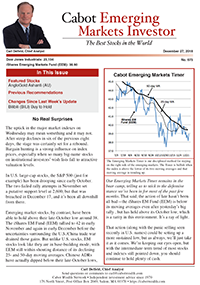 ✓	24/7 online access to private Cabot Emerging Markets Investor website. ✓	Direct email access to Chief Analyst Carl Delfeld for answers to emerging markets investing questions. Join now for immediate access.